Posted <2017-05-26 Fri 17:33> by Aaron S. Jackson. I have a few leads on getting a PDP-11, which would make an excellent new addition to my current (and very small) DEC collection. I won't mention any names, partially out of respect, but also because I want them to myself. PDP-11/45 from Europe. It would be a lot of fun, and is supposedly still working, but the seller wanted about EUR 3000. That's too much for me, but good luck to him selling it. PDP-11/03 also from Europe. I consider the 03 to be the baby of the PDP-11 family. It is an LSI model, and the first PDP-11 to have a power on self test. However, it only has about 40KB of RAM, which in my opinion basically makes it a microcontroller, but I'm still interested. The main thing I want to run is some sort of UNIX. There is a adaptation of Unix V6 called Mini-Unix. While Mini-Unix could run on an 11/03, it would require a hard drive which adds a whole new element of complexity. A further reduced version of Mini-Unix is called LSI-UNIX, often abbreviated to LSX. LSX is a complete UNIX operating system and includes the C libraries and compiler. Additionally, it fits on two RX01 floppies. An RX01 floppy can hold 256KB. So this is a very small variant of UNIX, and it makes the PDP-11/03 just about usable. <2017-05-29 Mon 20:01> The kind person that has previously discussed PDP-11/03s with me has also sent me some pictures of what I think is a different PDP-11/03 (at least, it's in a PDP-11/03 chassis) which may or may not be available. We don't know yet. However, take a look at the pictures below (hopefully he doesn't mind me posting these). This is very interesting. 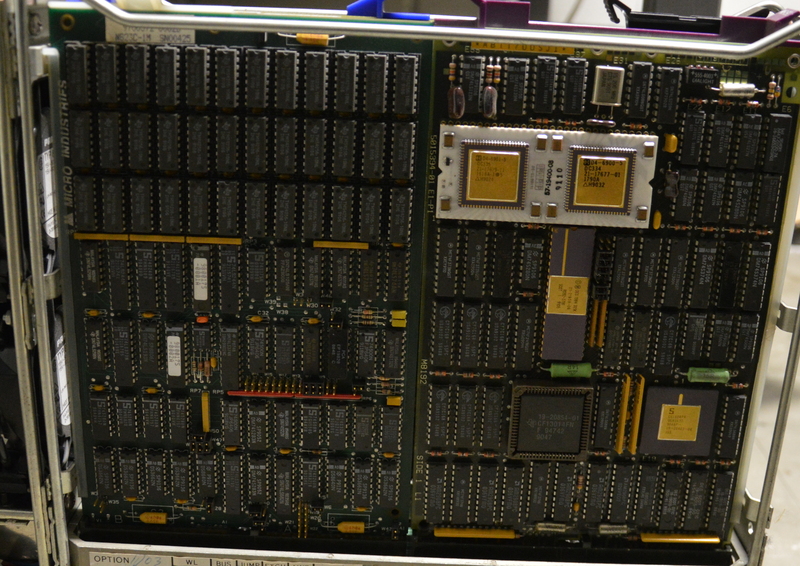 If you zoom in on the top of the processor card you will see that this is a M8192-YC. I believe these are a PDP-11/73 processor, which basically makes this a PDP-11/73. The next interesting thing is the card to the left of the CPU. If you zoom in on this you will see a 12x3 array of TMS4256 memory chips. 12*3/8/1024*12*3 is 1MB. This makes me very happy because it means that as long as I can get storage sorted, I would be able to run 2.11BSD on this machine!